When it comes to holiday cheer, you can’t go wrong with personalized gifts. Whether you sew every stitch yourself or have something made in a one-of-a-kind design from Roostery, you’ll find the perfect match for everyone on your list. 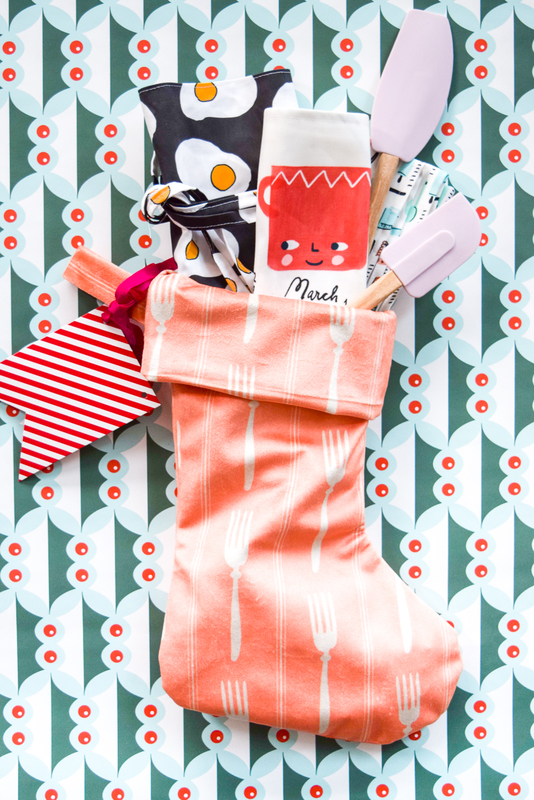 To kick off the season of giving, Ariel of PMQ for Two is back on the blog to share four personalized stocking ideas. 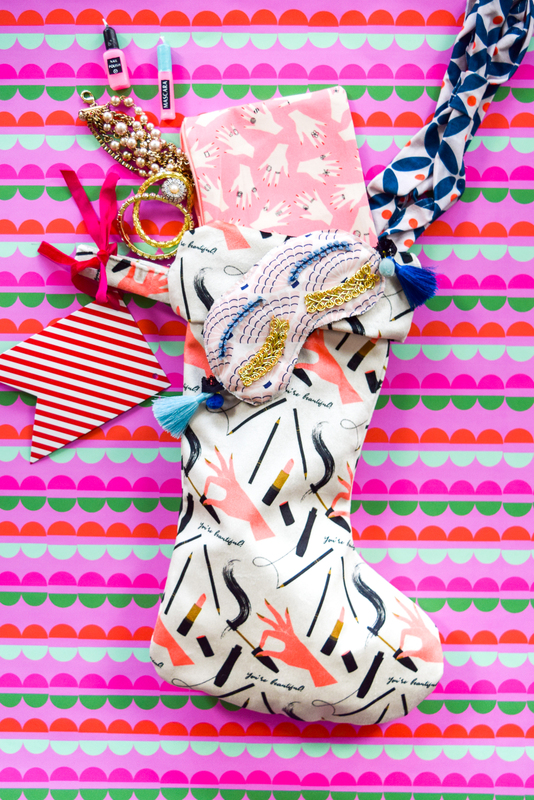 If you’re hosting a gift swap with friends, this guide will be your go-to for giftable inspiration! 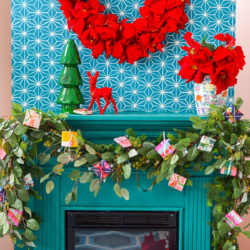 Bonus: See how to style your mantel with a gift wrap garland from Ariel! Ariel: ‘Tis the season to make, buy and gift thoughtful presents to the people in your life. Candles and soaps are cool for everyone else, but you might want to get your besties something super special that will mean the world to them! Why not give them something you made and curated with love? 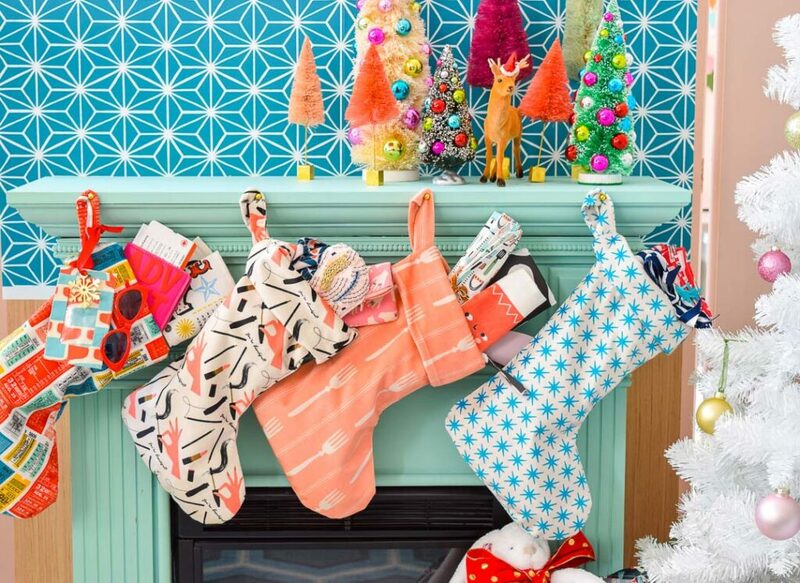 These four Celosia Velvet™ Christmas stockings are filled with goodies for The Baker & Chef, The Traveler, The Mixologist and The Beauty Junkie in your life. 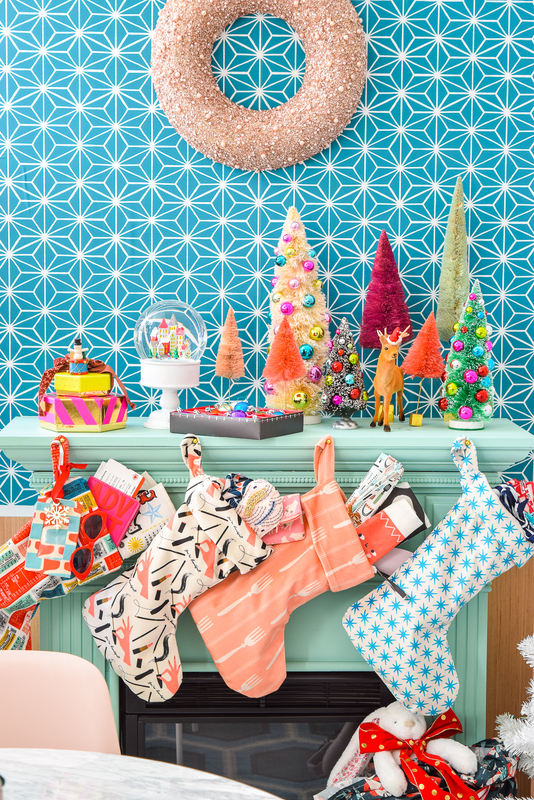 Download your free stocking pattern to get started! 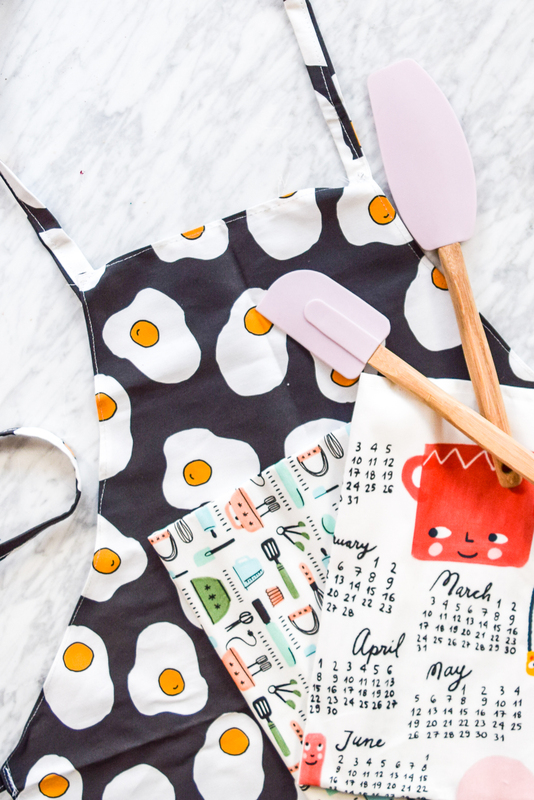 The baker or chef is always covered in flour or sauce, so why not make them an apron that will be eggcellent for their cooking endeavors? Find all the options for a DIY apron here! Don’t forget a few ready-made tea towels from Roostery. Their prints and linen are perfect for mopping up messes in the kitchen, or just sitting pretty on the oven door. 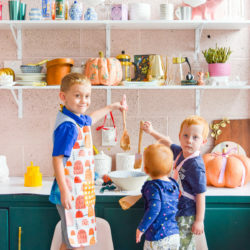 Anda’s Kitchen Friends 2019 Tea Towel Calendar will keep the chef company in the kitchen as they whip up their next tasty treat. 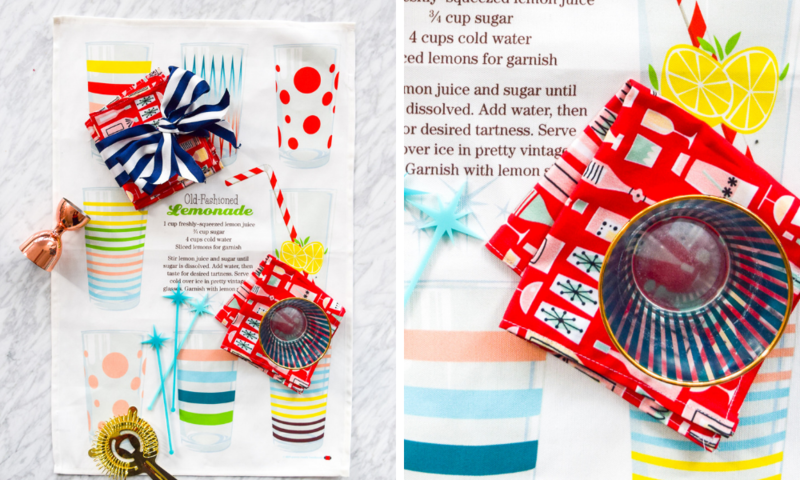 For an extra personal touch, turn one of their favorite recipes into a timeless tradition: a recipe tea towel! Don’t forget to throw in a spatula or two, and maybe your fave olive oil. For their stocking, this bold peachy print is perfect and wouldn’t look out of place hanging on a kitchen cabinet door, or the mantel. This girl gets MILES! She is on the road at least once a month for work or for pleasure, and is always sending you postcards from the world’s weirdest attractions. A handmade luggage tag in a fun retro print will set her apart at the baggage claim. 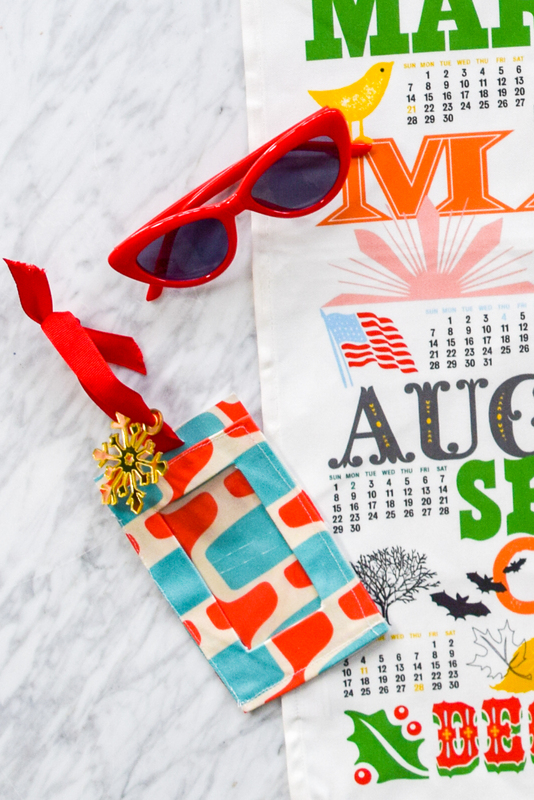 Meanwhile, a tea towel that doubles as a calendar is a great way to remind her of where all the time in between trips really goes. Throw in a new passport cover and a pair of chic shades, and you’re in business! 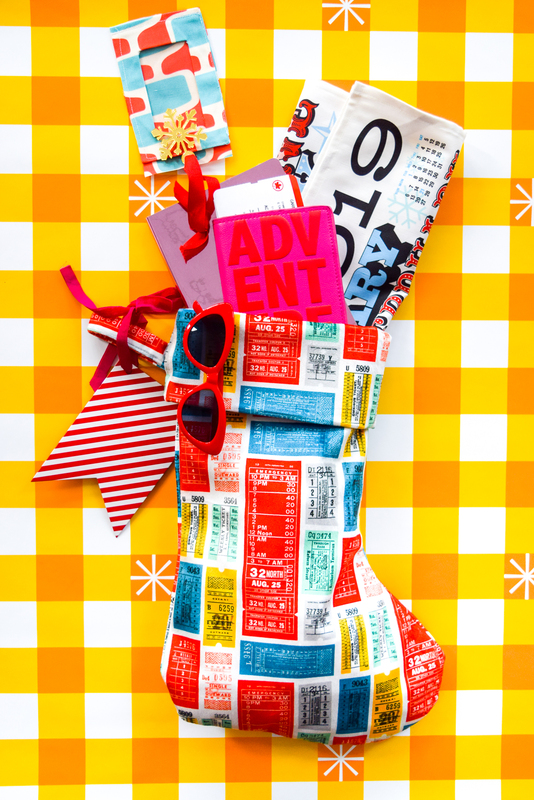 Her stocking can only be one thing: ticket stubs! This colorful print in Celosia Velvet will allow her to experience a taste of home if she’s traveling over the holidays. The mixologist has a stockpile of bitters and 10 different gins on hand. (Who knew there was more than one kind?!) 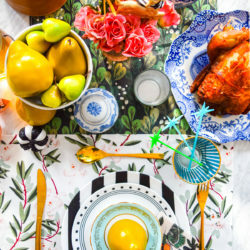 Get creative and supply their bar with more than just booze—Give a set of Roostery cocktail napkins in a festive mod print or a tea towel featuring a drink recipe and fun glassware for the perfect finishing touch. While you’re at it, don’t miss the entire selection of retro bar cart designs from the Tea Towel Design Challenge! Making your own cocktail napkins? Find out the secret to sewing mitered corners for a professional finish. 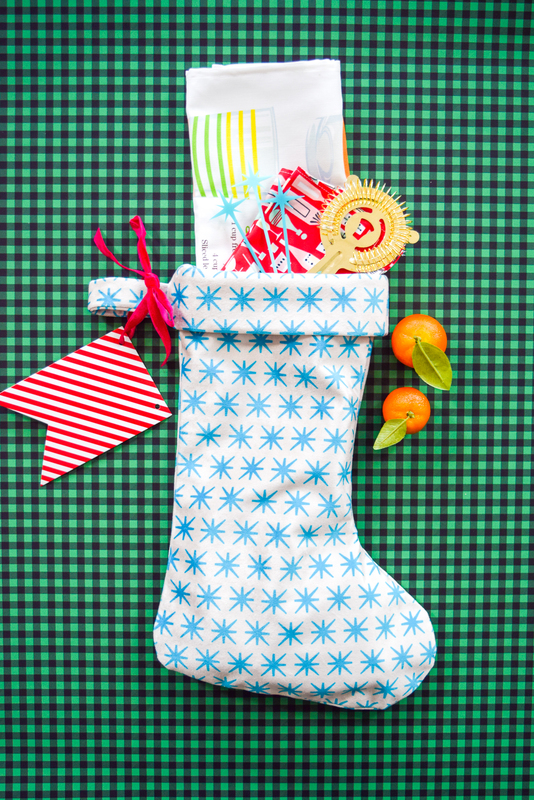 Their stocking looks fab in a blue atomic starburst and will hold any and all mini bottles or fancy stir sticks. Cheers! This lady never shows up without a flawless #lewk and has always got the perfect shade of foundation on. How does she do it?! Magic. 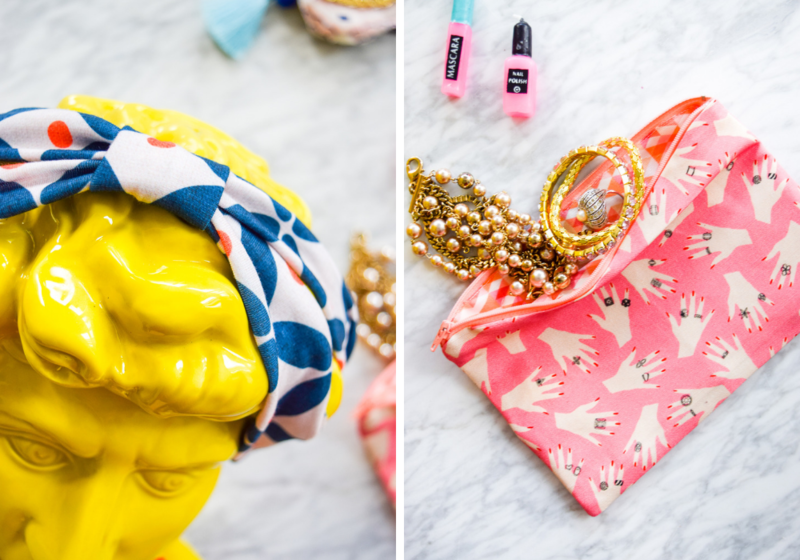 Give her a mini pouch to store her current obsessions! This adorable lined zipper pouch also doubles as a jewelry bag, but leave that choice up to your beauty. While you’re at it, throw in a handmade turban headband in Modern Jersey and sleep mask. For a funky twist on the classic sleep mask, don’t miss my Holly Golightly inspired sleep masks. Top it all off with a gift card to her fave beauty store, or some adorable nail polish and mascara shaped candles. Her stocking would look adorable in any fabric, but the manicured hand feels like the perfect complement to her manicured style. Don’t see your friend in these archetypes? Not to worry! Spoonflower has a wild mix of patterns (750,000 and growing!) from various artists, in all kinds of styles. Looking for something in particular? Try your luck with the search bar or check out their curated Weekly Design Challenge collections. 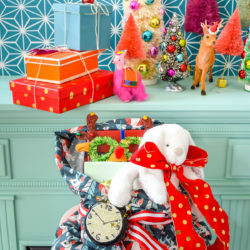 Wrapping presents doesn’t have to be a solo-activity! See how to host a gift wrapping party with Ariel. 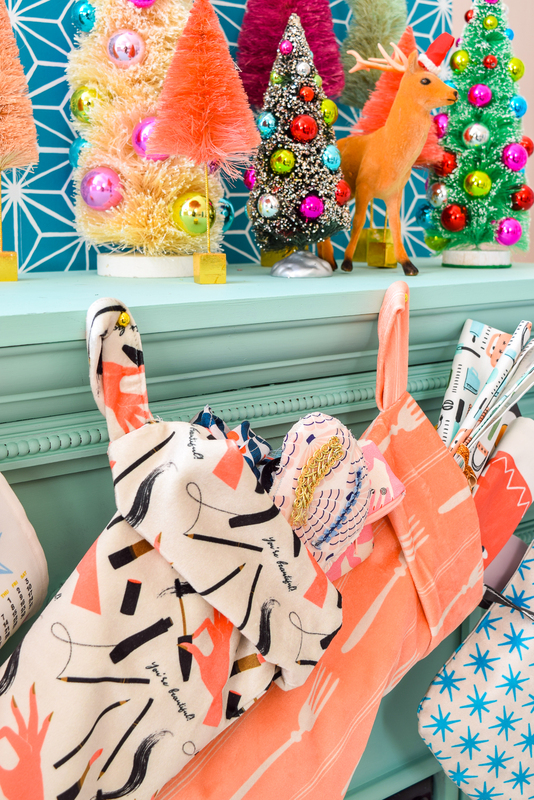 Ariel creates bright, bold, colourful and creative home décor and DIYs (and cocktails). 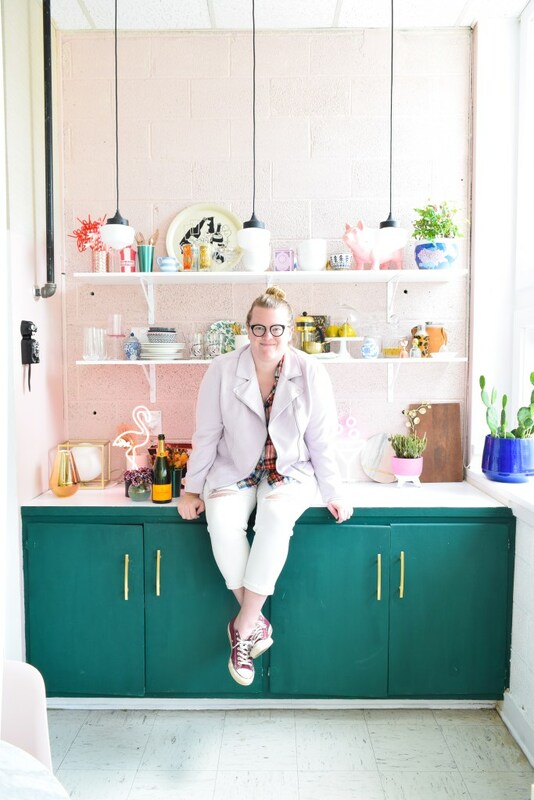 She’s worn several hats to date but has settled on the crown that comes with being a colour-wielding Queen and décor blogger, not to mention, businesswoman. Follow Ariel on her crazy journey called life while she figures what colour to paint the walls and where to hang that darn mirror over on her Instagram feed @pmqfortwo! ~jaw drop~ Friends, I am absolutely BLOWN AWAY. Ariel, your ideas are spot on, and the photography is out of this world! THANK YOU ALL for making my prints look SO. INCREDIBLY. FAB.